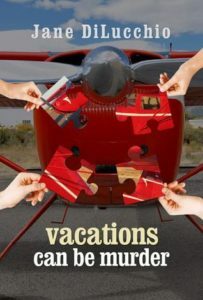 When Diega DelValle and three of her friends go on an impromptu vacation in Talkeetna, Alaska, Diega envisions an enjoyable summer break from teaching along with time to heal from a break-up. However, even before the friends arrive, this small town on the edge of Denali National Park becomes a less than idyllic vacation spot. Gail, a Talkeetna native, dies on the mountain. Melissa, Gail’s cousin and a former student of Diega’s, arrives in Talkeetna and raises doubts about the death being accidental. Due to Melissa’s pleas for help, Diega and her friends are thrust into an investigation of a small town and its inhabitants-an unsavory pastime that turns deadly. This is the third book in the Diega Delvalle series by Jane DiLucchio and is another winner. I have really enjoyed reading the series and seeing the characters develop more fully. This time Diega and her group of friends, Tully, Felicia and Jenny, are off on vacation to Alaska and hope to see the elusive Mount McKinley. They bump into a former student of Diega’s, who is there to organise her cousin’s funeral. She believes her cousin was murdered and when she too is found dead the ladies feel compelled to investigate. This was a really interesting story, weaving many threads that had me guessing right to the end. I could never decide who to trust and there seemed to be a lot of motives and people with secrets they didn’t want getting out. Diega and her friends had to deal with apparent police incompetence and homophobic attitudes as well as trying to understand small town Alaska. The women were more of a team in this book and I think that was the right way to go. Diega is a good character but she needs her pals around her to make things work. I really liked Tully as she seems to have the enthusiasm and get-go attitude that Diega needs to spur her into action. I enjoyed the fact that the story was set in Alaska and the author really excelled in describing the area and the various types of people living there. The state was a character in itself. Another really enjoyable book from Jane DiLucchio and I hope she decides to continue with this series. This was a scintillating murder mystery with lots of twists and turns. Once again the four friends were reunited and thus the adventure began. I found this novel a little more sombre than previous ones in the series but this might be the author reflecting the situation and character of Diega. The opening chapter immediately gets the reader involved in the action and clearly indicates the antagonist who we will have to unmask and discover. I really enjoyed the way the reader is rapidly drawn into the plot and your interest instantly captivated. The absorbing and well described landscape also added depth to this novel. Along the way clues were discovered, problems posed and solved and characters introduced. All this as well as personal additions to the magnificent fours lives and loves. The ending exploded and all the questions answered, pulling all the previously unexplained threads together in a very satisfying and explanatory way. I really appreciated this well written novel and relished the convoluting plot, I did feel it lacked some of the humour of previous books in the series. This is the third in the series of Diega DelValle Mysteries, and it’s just as enjoyable as the first two. This go ’round finds Diega and her friends in Alaska for a vacation, where they run into an old acquaintance and mysterious deaths. Having learned their lessons from their previous experiences with murder investigations, the four friends initially try to stay far, far away from looking into anything to do with the first death that’s brought to their attention. However, when the person fighting to prove that death was anything but accidental ends up dead and the investigation starts to point to Diega, the four friends gear up into investigational mode. There seemed to be a whole lot less bumbling around by the four this time, which means at least they’re getting better at it. Unfortunately for me, I was only partially right about whodunnit this time, bringing my sleuthing score to 1 for 3. It was a fun ride, though, and I’m definitely looking forward to my next DiLucchio read.